A relatively modest but strategically-directed Australian Federal Government investment will result in better vision and eye health for Australians, said the CEO of Optometry Australia Lyn Brodie last week. Optometry’s national peak professional body has just lodged it’s 2019–2020 Budget Submission Sustainability for optometry and primary eye health care. It is calling for the Government to support readier access to primary eye care for middleaged Australians, Australians living in rural and remote areas and Aboriginal and Torres Strait Islanders, and investment in applied research to pilot innovative new models of care. “Regular access to quality optometric care is an essential element to reduce the significant social and economic cost of preventable blindness and vision loss. With a prudent and relatively conservative investment, the Government can generate a positive – and almost immediate – impact on eye health for Australians, while reducing vision impairment,” Ms Brodie said. “With more than 12 million Australians reporting a long-term eye condition, an ageing population and an increasing prevalence of chronic disease with associated eye pathology, it’s vital for all Australians to have access to timely and affordable access to primary eye care. Optometrists play a crucial role in reducing the heavy social and economic cost of avoidable blindness and vision loss. More than eight million Australians already access eye care from an optometrist each year. Optometry Australia members are vital in preventing, detecting and managing the development of ocular and systemic conditions that reduce productivity and require costly specialist care", she said. Investigating new models of care – for example, integrating optometry into primary care and collaborating with tertiary eye care services. According to Optometry Australia, key steps towards these essential goals will be achieved by a relatively modest $11.56 million in 2019-20. 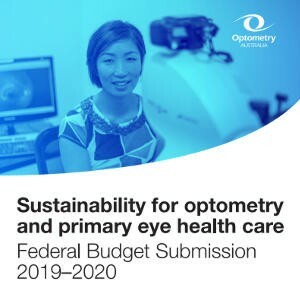 Optometry Australia’s national peak professional body has just lodged it’s 2019–2020 Budget Submission Sustainability for optometry and primary eye health care.